I have been eagerly waiting for this post for some time, because Dallas is dummymandered. While Harris Democrats have been outspoken against the House map, I think that there are quite a few Dallas Democrats who feel like the GOP just shot themselves in the foot. I drew the Dallas map with Dave’s App, and not a single seat had McCain over 55%. While we really shouldn’t be talking about sweeping Dallas, it could happen with this map. Of the group, I think Branch is probably safest, because I think Highland Park and University Park would like to elect a perceived moderate Republican, which is Branch. It also helps Branch chairs Higher Ed, and SMU is in the District. I could easily see the rest in Democratic hands by 2020. As for Tarrant, I think Paula Pierson wins 101. (Full disclosure: Paula’s son is my precinct chair, and I consider him a friend.) She has represented parts of that district both in the State House and the City Council. I can think of some African Americans, who might make good candidates, but I doubt any of them would run against Paula. The highest profile Hispanic in 101 is Arlington Councilman Robert Rivera. However, he’s a Republican, so I don’t see him running unless he switches sides. This could happen since Municipal races are non-partisan, and I doubt many know that he is a Republican. Other than 101, 96 is the most likely to flip. Zedler is a remarkably flawed candidate, and his district is one of three super fast growing districts. The growth in his district is largely due to Democrats too. The other two high-growth districts are Geren’s and Truit’s districts. Those had to contract and to the North where Republicans reside. That’s why they got more Republican. It’s more about geography and growth than really trying to make the two of them safe. Now, the R’s had to basically spread the Republicans from the two eliminated districts over the whole county (mostly in the North, since that’s where the relative growth wasn’t), but they can’t really affect the fact that the eliminated districts were themselves only marginally Republican to begin with. Thus, everybody except 108 is doomed by 2016 (when 108 might finally become competitive, and The Dallas Country Club sinks into the tarpits with the rest of the dinosaurs as the Park Cities elect a Democrat to the Leg). In 2012, assuming funding, every one of the races will see a competitive Democratic race (maybe even including 108 just for sport), and we’ll win 6 of the 8 (102 probably will barely hang R). Snowballs rolling downhill pick up speed, and this will be the first election when Democrats control countywide government. The smart Republicans will admit that 2010 was a aberration. Even Paul Burka has said that the war for Dallas County is over and the GOP has lost. 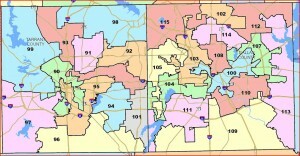 Look at what the new Dallas County Commissioner map looks like. The GOP is now packed into one commissioner precinct! In the Solomons map the GOP did a great job of spreading Republicans around and either packing Democratic districts like (HD103 or 100), or moving lean Dem precincts into veteran Republican districts (108, and 114), or Republican districts that could absorb them (112). I’m hoping Former Rep. Robert Miklos runs in the new 107 against Sheets and Former Rep Kirk England runs against Haper Brown in 105. I think we have a shot at those two districts now. 107 is a collection of lean Republican precincts with a few low turnout Dem precincts. I think 102, 108, 113, and 114 are the next tier. Of these Carter in 102 and Driver in 113 can be beaten by mid decade with the right candidates. 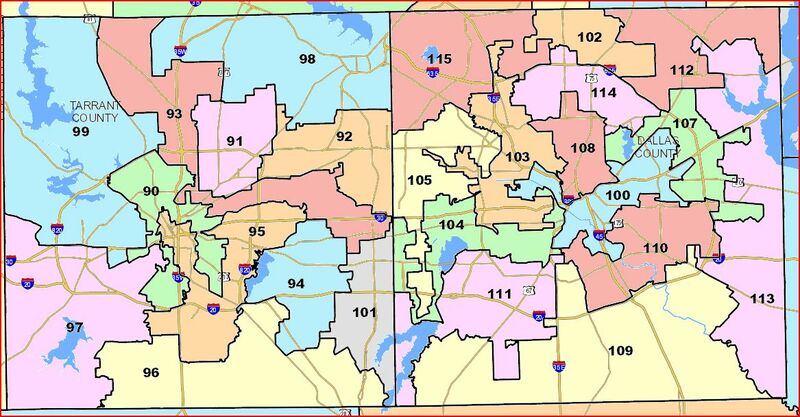 113 is probably moving further to the Dems than 102 because Mesquite is pretty much purple now and Garland is moving that way, while Richardson is still a GOP stronghold along with Far North Dallas which are most of 102. If either Branch or Hartnett run for AG in 2014, we’ve got a shot at either district. These will be the toughest veteran Republicans to beat because Branch has a strong base in Park Cities/M-Streets, and Hartnett is strong in Preston Hollow and Lake Highlands which are still Republican areas but are changing with the under 50 crowd. I think HD112, and HD115 are safely Republican but we ought to run candidates in these seats as well. The map is 8R-6D now, but by 2018 it may be 11D-3R. Precinct 1233, I hope you’re right about winning 6 of the 8 seats but I don’t see how the Dems do it in 2012 though we should try. I could add HD113 to the list so I could see a shot at 3 seats in 2012, but I can’t get to 6. I live in HD114 and Hartnett could have a strong challenge from someone but even with Hamilton Park and a ton of the heavily minoritiy apartments in Lake Highlands and progressive voters along white rock lake, I don’t think that’s enought to overcome his strengths within the single family homes in Preston Hollow and Lake Highlands. I don’t think Branch can be beaten unless you can talk Fmr Rep. Allen Vaught into running which would be an interesting race.